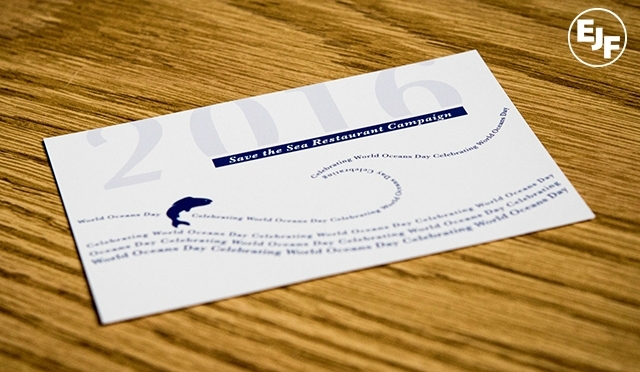 How to Celebrate Seafood and Support a Great Cause on World Oceans Day? Environmental Justice Foundation (EJF) and leading restaurants across the UK are partnering to protect the world’s oceans, end illegal ‘pirate’ fishing and seafood slavery. Today is World Oceans Day and for the next month, 24 restaurants across the UK will join EJF in highlighting how sustainable sourcing and consumer choices help protect our oceans and keep seafood on our menus in the long term. Customers visiting the partner restaurants are invited to make a donation to EJF’s Oceans Campaign, combating illegal ‘pirate’ fishing in West Africa and Asia and protecting threatened species – like sharks, turtles and dolphins - and the livelihoods and food security of coastal communities. The campaign also helps to fund EJF’s work to end people trafficking and slavery on fishing boats. In the last three years, the campaign has received support from 43 restaurants with 32 Michelin stars amongst them, raising over £25,000.